Height 5 feet 4¾ inches. Weight 135 lbs. Chest measurement 33-36 inches. Complexion dark. Eyes brown. Hair black. Eyes both 6/6. Hearing and colour vision both normal. Limbs and chest well formed. Full and perfect movement of all joints. Heart and lungs normal. No illnesses. Free from hernia, varicocele, varicose veins, haemorrhoids, invterate or contagious skin disease. Good bodily and mental health. No slight defects. No fits. 4 March 1917 - admitted to hospital at Etaples - sinews of the foot (...? slight). 19 March transferred to Base Depot in France. 7 June 1917 - wounded in action and admitted to hospital at Etaples on 8 June - gunshot wound to left thigh. 3 July transferred to Base Depot in France. Thomas Joseph Histen was the second son of Denis and Honorah (Norah, nėe Rooney) Histen, of Temuka. His parents, both from Ireland, had married in New Zealand in 1887, and Thomas was born at Timaru on 20 April 1899. A week later, on 27 April, he was baptised Thomas Joseph in the Timaru Catholic Church. Along with his siblings, Thomas attended Adair School in his early years. The family lived in this district for some years, until they moved to Clandeboye about 1909. There he continued his schooling. His father, Denis, served on the Adair School Committee for three consecutive years in the 1890s and later on the Clandeboye School Committee. Thomas was in fact only 16 years old when he enlisted and “donned khaki”, but he masked his age in giving a birth date of 1 January 1896. Consequently he was only 18 years old when he was killed in action. Thomas was living at home (Factory Road, Temuka) and working as a farm hand for a Temuka farmer and on his father’s farm at Clandeboye, when in 1916 he volunteered to serve. Well known in the Clandeboye district, he was a genial “sport”. He was of a slight build, as would be expected of a 16 year old, but he was in good physical shape. Leaving Timaru in early March 1916, he travelled north by the express as part of South Canterbury’s quota for the Fourteenth Reinforcements. With the New Zealand Rifle Brigade he left Wellington on 26 June 1916, destined for Devonport. In August he proceeded overseas from Sling. His father received a cable, in March 1917, stating that Thomas was admitted to the 24th General Hospital at Etaples on 6 March, suffering from inflamed sinews of the foot. On 12 April he was transferred from the hospital to the Base Depot in France, and in May 1917 he joined his Battalion at Rouen, only to be wounded in action in early June 1917, in the battle of Messines. This time he suffered a gunshot wound to his left thigh, though initially it was reported as a not serious case. After time in a base hospital in France, he had again joined his unit before being killed in action in the Field in Belgium on 12 October 1917. In the aftermath of an early morning advance, Thomas became a victim of the Passchendaele offensive, falling on New Zealand’s blackest day. Perhaps he was one of the determined individuals who tried to get through the German barrier, but were quickly killed. Thomas is buried in the Tyne Cot Cemetery in Belgium, where he lies at rest with nearly 12,000 soldiers of the Commonwealth Forces in the largest Commonwealth War Graves Commission cemetery on the Western Front. His name is inscribed on the Timaru Memorial Wall, the Temuka RSA Roll of Honour; the Temuka War Memorial, the St Joseph's Church, Temuka Roll of Honour, and the Clandeboye Hall Memorial Tablet. The St Joseph’s Church, Temuka, Memorial, an “exceedingly beautiful” monument to the memory of those who had fallen in the war, was unveiled after a Memorial Service on 25 April 1922. During the service appropriate music was provided by the choir and an excellent address was delivered by the Rev. Dr. Kennedy. The name of Thomas Histen was heard again on Anzac Day, 1927. A Requiem Mass was celebrated at St Joseph’s Church, Temuka. The celebrant preached a very stirring sermon based on the Book of Wisdom (Chapter III, Verses 2-5). He pointed out that the Gallipoli campaign and later “gigantic episodes” would remain for all time a wonderful symbol of the age-old courage of men. He reminded the lads present that the enormous sacrifices made by the soldiers of New Zealand and other parts of the Empire were helping them to have brighter and better lives, and that all should render thanks to God, who had delivered them out of the hands of the enemy. They had gathered to commemorate the landing at Gallipoli and also to set aside the day to show their deep and grateful acknowledgement of the services of the men who had fought and died for them on other fields of the great battle-front. “The light of immortality that flashed from the abandoned tomb of the risen Christ lingers on in every mound of Flanders mud and clay, the gullies of Gallipoli, the sands of Palestine and Egypt, on the quiet churchyards in English villages and on God’s acres in New Zealand.. . . . And to-day, before God’s altar, we remember them with the love we bore them and the pride we shall have in them,” he concluded. Before the Dead March was played by the organist, the names were read of those from the Temuka parish who had died “on the field of honour” – among them that of Thomas Histen. 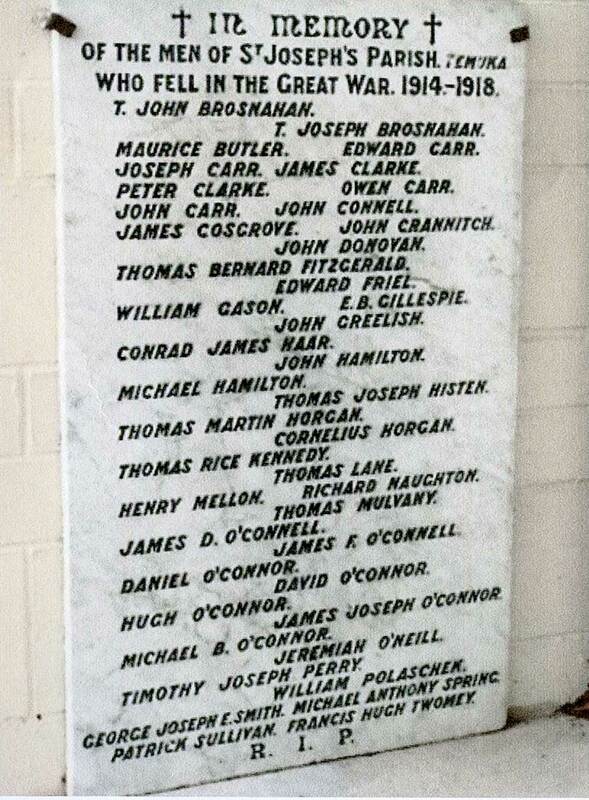 In late August 1919 a tablet placed on the wall above the hall stage at Clandeboye was unveiled – in “one of the most important ceremonies ever conducted in the district.” The memorial tablet contained six names, one of them being T. J. Histen. Anzac Day 1924 was fittingly marked when a procession of school children and the general public, including many returned soldiers and relatives, marched to the Clandeboye Hall, where the memorial tablet to the fallen was hung and where those gathered paid honour to those whose names were inscribed on the memorial. Mingled with the feeling of grief were thankfulness and gratitude and above all pride in the great achievement, according to one speaker. The poem “In Flanders Fields” was rendered and Mr Gunnion, the Mayor of Temuka, opened his address with the words “Lest we Forget”. The soldiers whose names were inscribed on the memorial had given their all that we might live in peace, he impressed on the children, before finishing as he had begun – “Lest we Forget”. The names were read out, wreaths placed and the National Anthem sung. Thomas Histen left no evidence of a will. How many 16 year olds would? His medals – British War Medal and Victory Medal, plaque and scroll were all sent to his father. These are the only acknowledgement of the efforts of a brave young lad to serve his country and bring freedom to successive generations; one who was very popular and a favourite with all who knew him. His sorrowing and loving family continued to remember Thomas, “a staunch and fervent Catholic”, for some years with In Memoriam inserts in the New Zealand Tablet. An older brother Denis Patrick Histen also served in World War One. He was spared to return home and carry on the Histen name.